This do-anywhere workout takes only five minutes -- so you can knock it out on a busy day or before a party. Here's what you need to know. Fire up your muscles from head to toe. 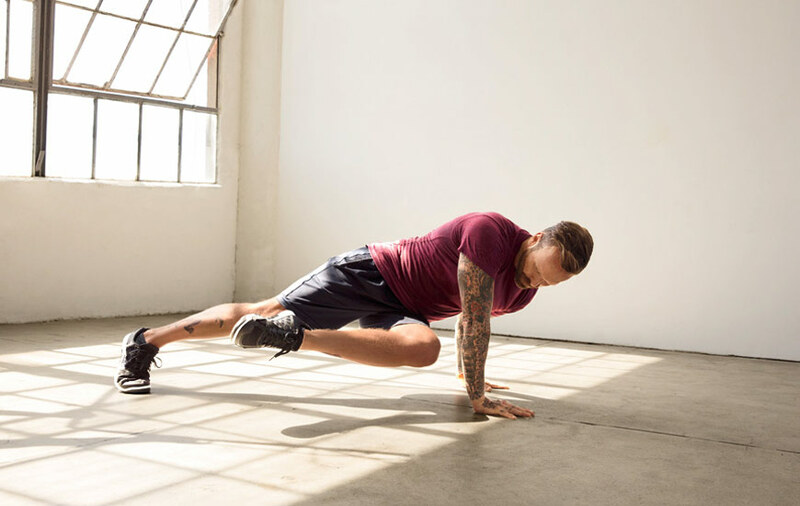 YOUR TRAINER: Bob Harper, celebrity trainer and host of the The Biggest Loser, which starts in January on NBC. YOU'LL NEED: A pair of dumbbells heavy enough to challenge you. Start with 5- to 10-pounders. DO: This workout up to seven days a week. Do 90 seconds of the broad jump (see below). Rest 10 seconds, then do 90 seconds of any other move. Rest 10 seconds, then complete 90 seconds of any other move of your choice. Rest for 10 seconds. Repeat the sequence for 5, 10, or 15 minutes a day. Stand with feet shoulder width apart. Squat, then explosively jump up and forward (as shown), landing softly, feet under hips. Repeat. Stand with feet hip-width apart, holding dumbbells at sides. Bend knees slightly and tilt forward at hips, back flat, arms straight, hands under shoulders. Bend elbows and lift weights toward chest (as shown). Extend arms and repeat. Stand with feet hip-width apart, a dumbbell in each hand at shoulder. 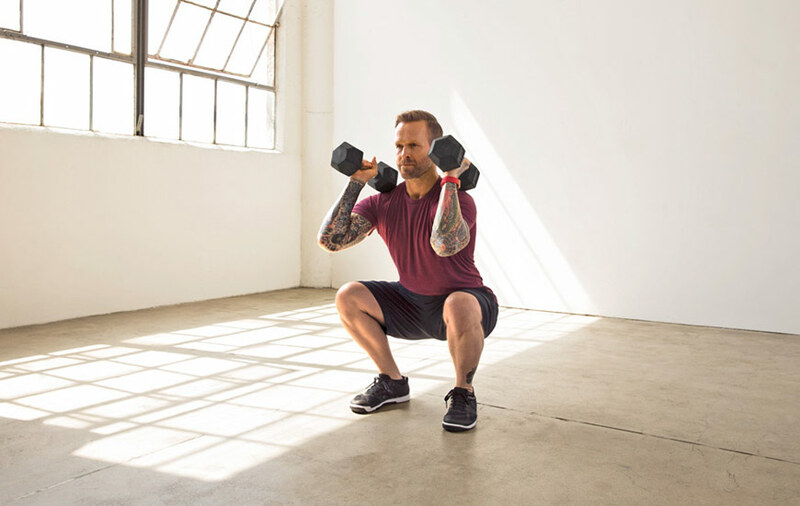 Squat as low as you can (as shown), then push up to stand and press dumbbells overhead in one movement. Return to squat and repeat. 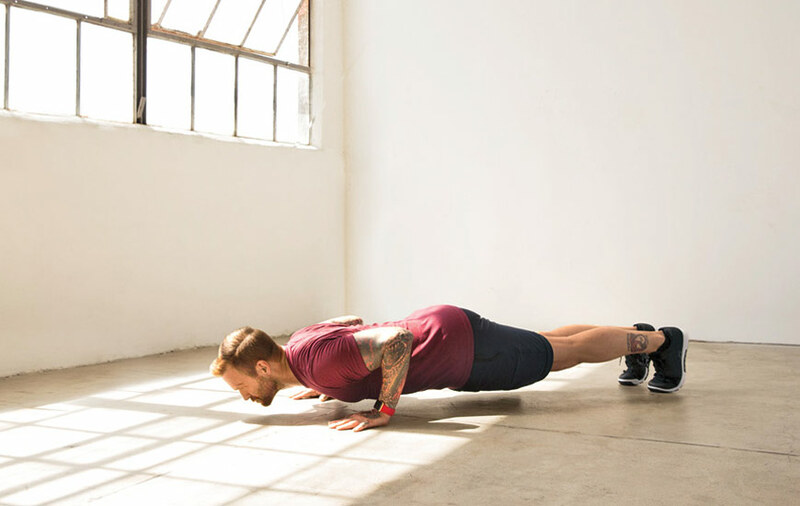 Start in a high plank, shoulders over wrists. Bend elbows and lower body (as shown) until chest, abs and hips touch floor. Lift hands a few inches, then place them on floor to push back up to start. Repeat. Lie faceup, knees bent, feet on floor, holding dumbbells. Bend elbows 90 degrees and open out to sides of shoulders. Squeeze glutes and raise hips into a bridge. Push dumbbells over chest as you extend right leg, keeping thighs parallel (as shown). Hold leg up as you do 2 chest presses. Lower leg and arms. Repeat, alternating sides. 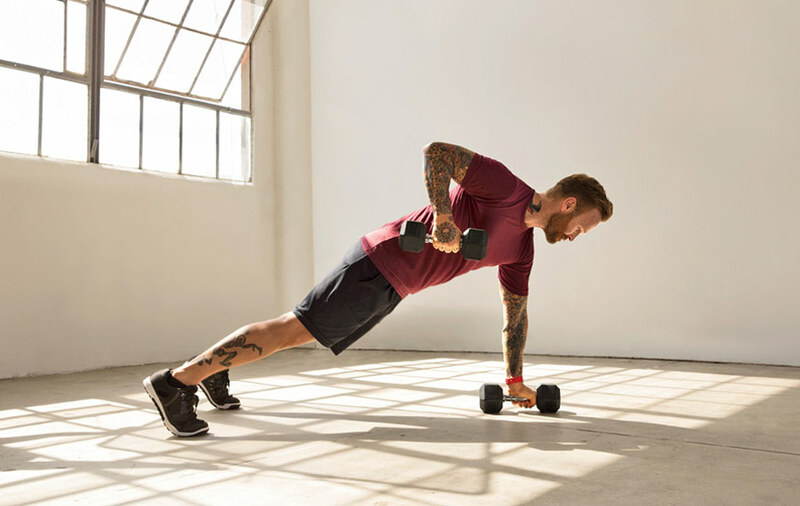 Start in a high plank, hands holding dumbbells on floor, shoulders over wrists. Do a push-up, then bring right dumbbell to chest (as shown). Lower dumbbell, do a push-up and repeat, alternating sides. Stand with feet shoulder-width apart. Squat, place hands on floor, jump feet straight back and lift left leg and draw left knee across chest to right elbow (as shown). Step foot back, hop feet toward hands and jump up, clapping hands overhead. Immediately squat, jump back and repeat, alternating sides. Now, watch the moves in action here.